Thursday night in the Berthoud High School gym the Spartan girls basketball team dropped their second consecutive game to a 4A team from Loveland. 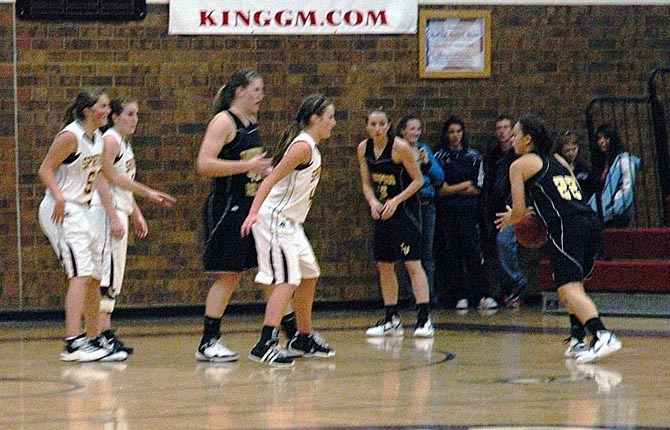 Tuesday night it was a 46-27 loss to Mountain View and on Thursday night the girls fell to Thompson Valley 54-28. The loss drops the Spartans to 3-2 on the year with one game remaining in the Spartan Basketball Invite. 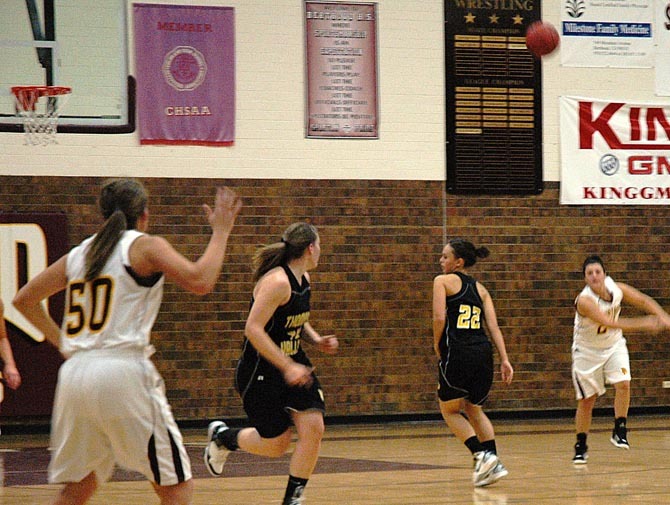 Thompson Valley took control of the game early by capitalizing on frequent Berthoud turnovers. The Eagles’ stout defense was the driving force behind an 11-2 run to open the game. The Eagles used the full court press early and often, exacerbating Berthoud’s turnover issues and allowing the Spartans only sparse scoring opportunities. “Oh we’re struggling with full court pressure,” Berthoud Head Coach Randy Earl said after the game. Thompson Valley had a commanding 15-2 lead after the first period. Berthoud was able to battle back into the game in the second period, out-scoring Thompson Valley 13-10. The Lady Spartans took advantage of the Eagles’ aggressive play, drawing fouls and converting 9/12 from the free-throw line. In the second period alone, senior guard/forward Danielle Wikre sank five of her six shots from the line while senior center Amy Loberg converted on three of her four free throw attempts. However, it was only from the foul line that the Lady Spartans had regular success shooting the ball and scoring points. Of Berthoud’s 13 second period points, only four came from the floor, all courtesy of junior Dillon Fagler. 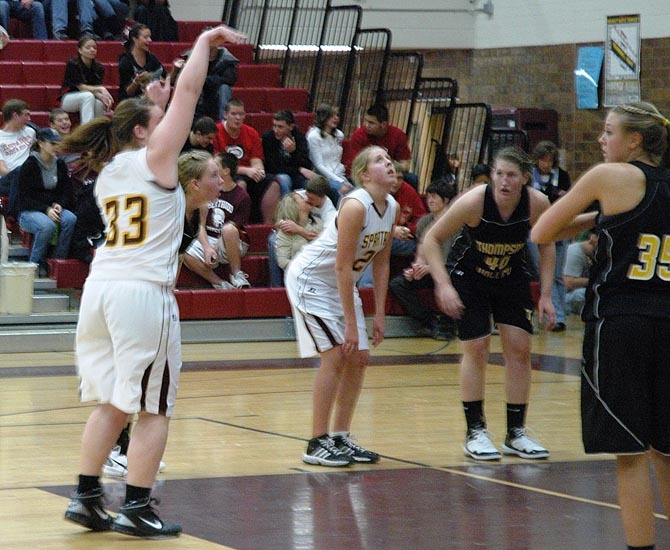 Thompson Valley regularly prevented Berthoud from getting the ball down low, forcing the Spartans to settle for lower-percentage shots outside. “Shooting has been our weakness lately and we had a lot of turnovers,” Wikre said after the game. 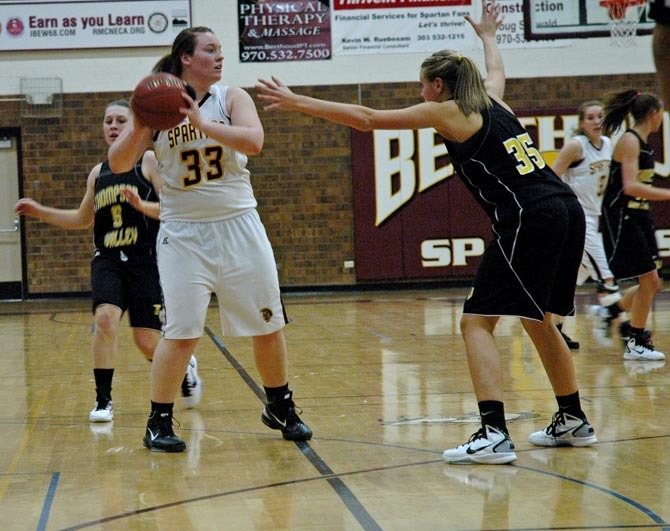 Thompson Valley was noticeably quicker than Berthoud and was able to steal the ball regularly throughout the contest. “They anticipate a lot and they’re always all over you,” Wikre said of the Eagles defense. Despite holding Thompson Valley to only 18 points in the combined second and third periods, the Spartans were never able to string together enough shots to establish any offensive momentum. “We played hard and we did a good job on defense….but you’ve got to make shots, you can’t just play defense all night,” Coach Earl said and added, “We probably had five lay-ups we missed in the whole game, that’s 10 more (points) right there.” Thompson Valley took over the game in the fourth period, out-scoring Berthoud by a football-like 21-7 score. Berthoud will play their third and final game of the Spartan Basketball Invite on Saturday night versus Northridge. Site contents copyright © 2019 Recorder Online	except as noted. All rights reserved. | 99 queries in 1.661 seconds.